We’re always hearing stories about how young people are influenced by their older role models, but how often do you hear a story about a group of older people that are influenced by a young person? This was the case in this story, a inspiring tale about a young Bangladeshi teen named Belal who did something that wowed everyone in his vicinity. He was hanging out by a local river when he noticed something strange. Sooner or later, that something “strange” turned into something “alarming.” An animal was calling out for help, and something needed to be done, and very quickly. A nearby photographer and his friends were standing around watching the entire thing unfold, and the photographer even took a bunch of snapshots of what happened. Thanks to him, we do lot more than just tell you the story with our powerful words and meaningful lessons. We can show you the pictures of what happened in real time, and when you see them, they’ll reach out of the computer and touch your soul. 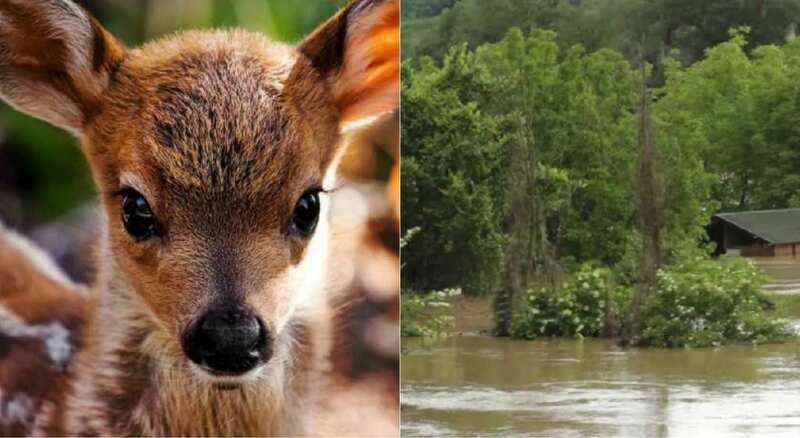 The animal that was in need of saving was a baby deer, and while his situation seemed to be pretty dire… things would soon take a positive turn. This is a story about a young boy named Belal, from the country of Bangladesh, who did something extraordinary. What does it take for someone to take a leap of faith? This is a question that isn’t easily answered, but it goes without saying that making that brave jump isn’t always easy. We are talking metaphorically as well as literally, because the story we are about to tell you reflects profoundly on one of the deepest elements of life. It showed us that even the smallest of people can make the biggest of impacts. When Belal took that majestic leap of faith, he helped us understand who we were as people, and you’ll soon see why. The interesting thing is, the story we’re about to discuss in full detail may never have seen the light of day if it wasn’t for a Bangladeshi wildlife photographer named Hasibul Wahab. 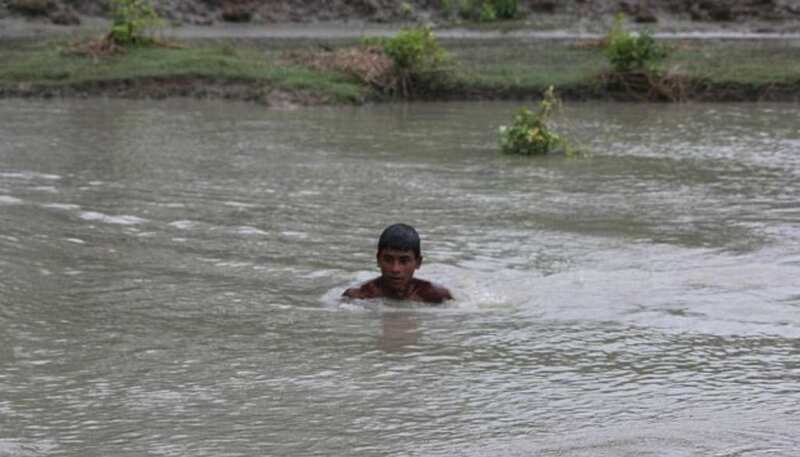 This man was on a trip of exploration, looking for all kinds of interesting things that he might have found in the wilderness, but we’re betting he didn’t expect to run into the scene that unfolded in front of him in a Noakhali river. The whole thing certainly took him by surprise, but with his instinctual experience as a photographer, he had his camera ready, and snapped photos of the whole thing – and they certainly told the story in a vivid way. 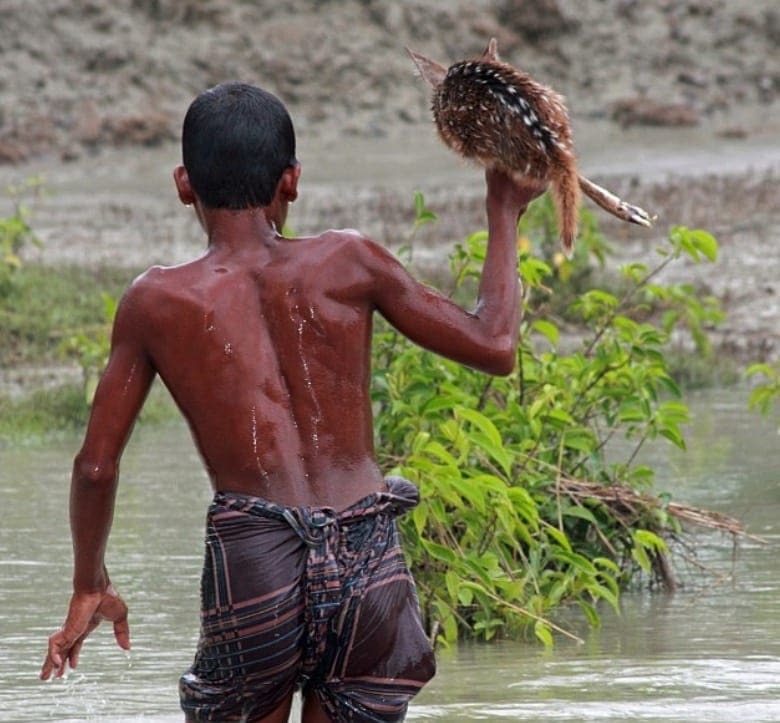 As we said earlier, the story is based around a young Bangladeshi teenager named Belal, who inspired us all with what he did by the Noakhali river. He was just hanging around there, minding his own business, when he noticed something in the river. He noticed an animal that was drowning and needed help, and was hanging on for dear life. Looking around, he realized no one was there to aid this animal, and understood that he, Belal, may very well be the difference between it’s life and death. But what kind of animal was this, and how in the world did it get there? 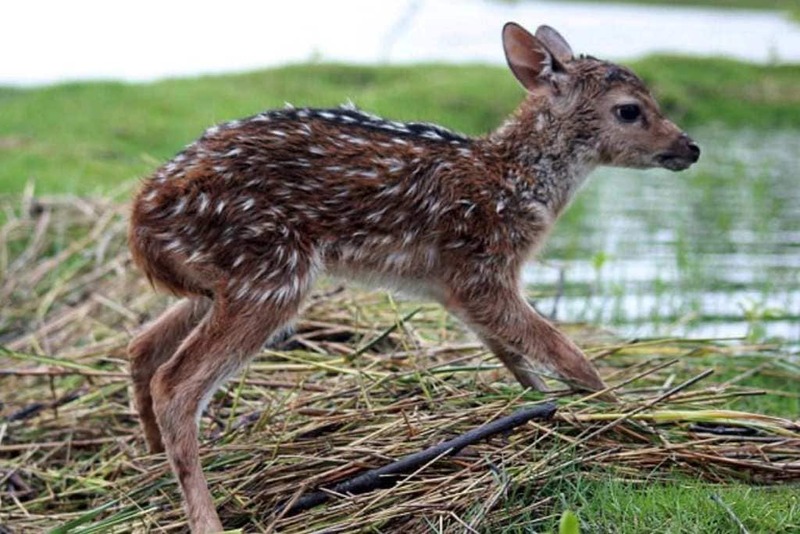 It turns out that this animal was in fact a deer – and as we all know, deers aren’t meant to be in the water. They aren’t the greatest swimmers, and there was also one other factor about this deer that we feel the need to mention – he was only a baby. But how did this baby deer get involved in this pickle in the first place? 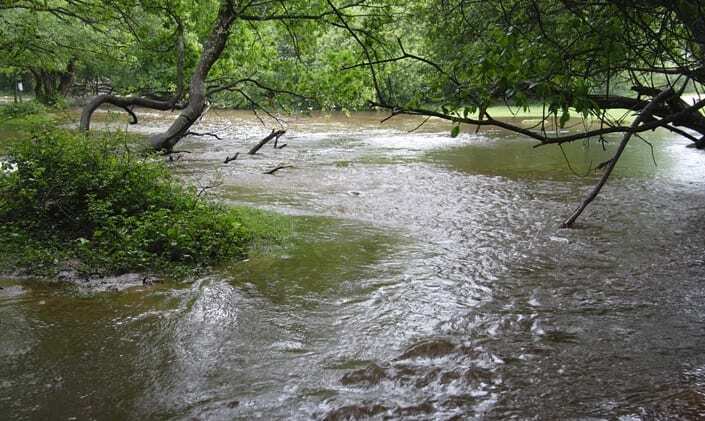 The river that the boy found the baby deer in had actually been the cause of a minor flood, one that actually separated him from his family. One can only imagine how frightened the little guy must have been at that time. Animals are not so different than humans, and you try to imagine a young human child separated from his parents, the feeling of fright is very similar. Now imagine if that child is actually a baby or a toddler – the feeling of fear is unsurmountable. 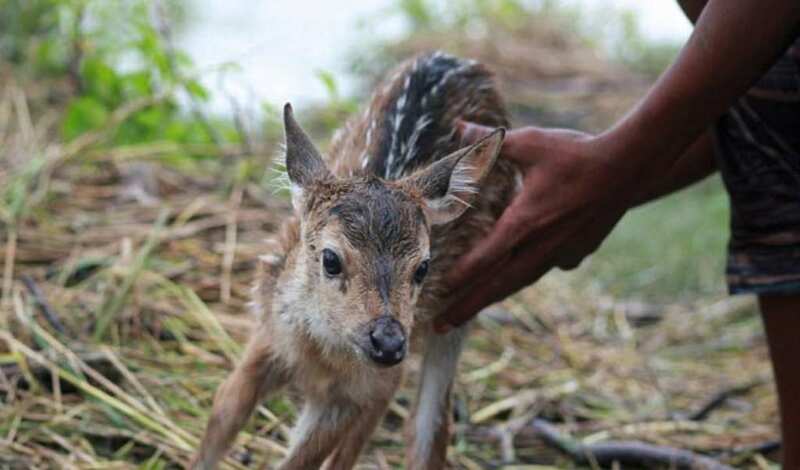 When you think about it in terms of comparing it to humans, it becomes clear how slim the baby deer’s chances of survival were at this point. 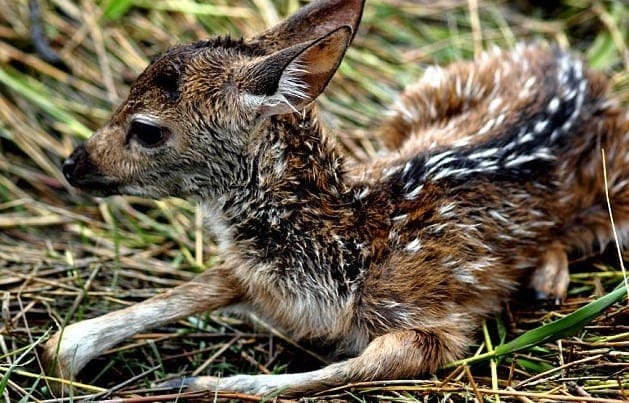 Even though this deer was born in the wild, he was still a baby, and hadn’t yet figured out to survive independently. 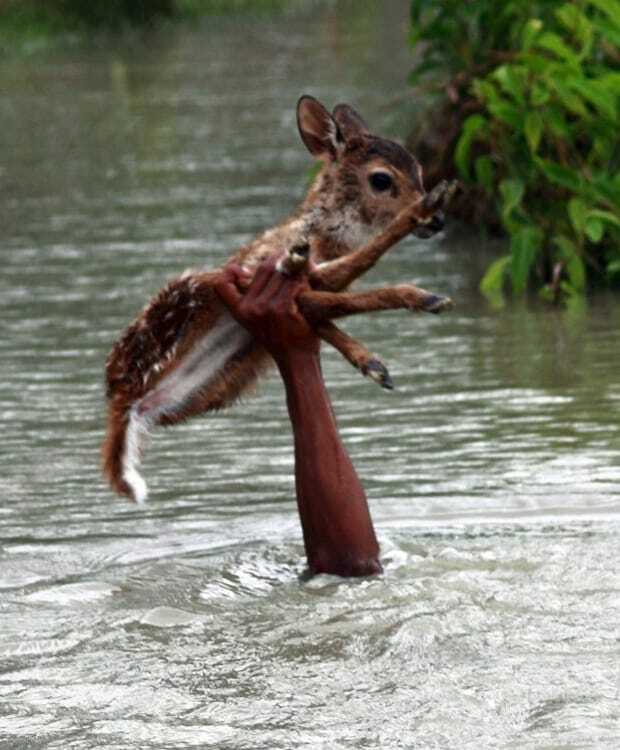 Add to that the fact that deers aren’t aquatic animals, and it’s apparent that this little guy needed some help. But miraculously, he had a savior come out of nowhere and provide help when he least expected it. Out of nowhere, a “knight” in shining armor came onto the scene, and gave this deer hope that he might actually survive this thing. The baby deer couldn’t believe his eyes and ears when he saw this young boy, and perhaps he didn’t even know what to expect. After all, he was still a baby deer, and this human kid looked like somewhat of an alien to him. But alien or not, the deer probably hoped that this boy would represent hope. As we all know, this boy did represent hope – and now was his time to shine. 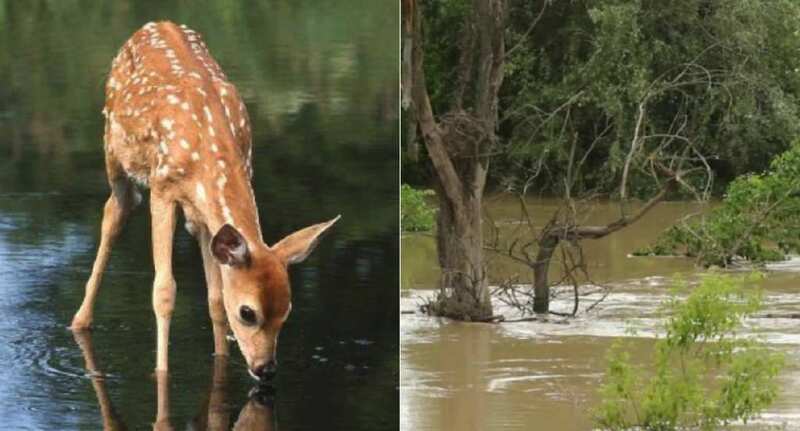 When he realized he couldn’t bear to witness this baby deer drown in front of his face, he dived headfirst into the river. 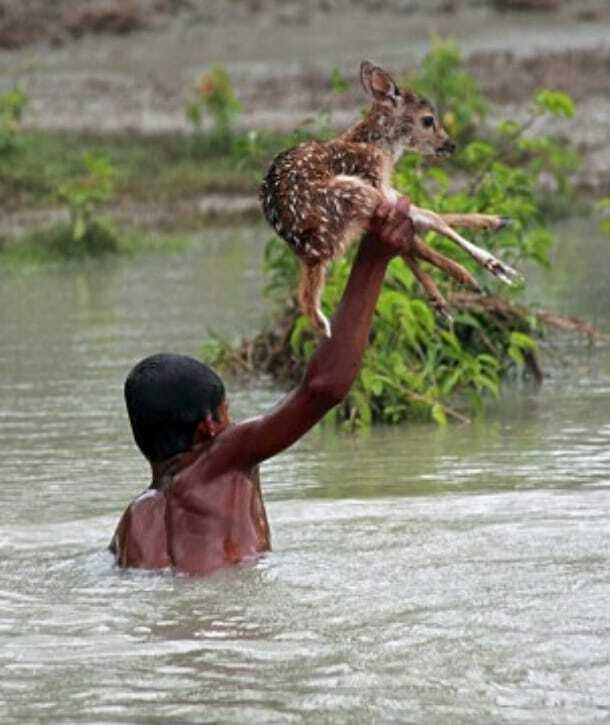 Like Aquaman on a bad day, this young kid was like a superhero in the way he attempted to save this deers life. As you’ll soon see in the pictures that were taken, Belal sacrificed his own body to save this animal in more ways than one. 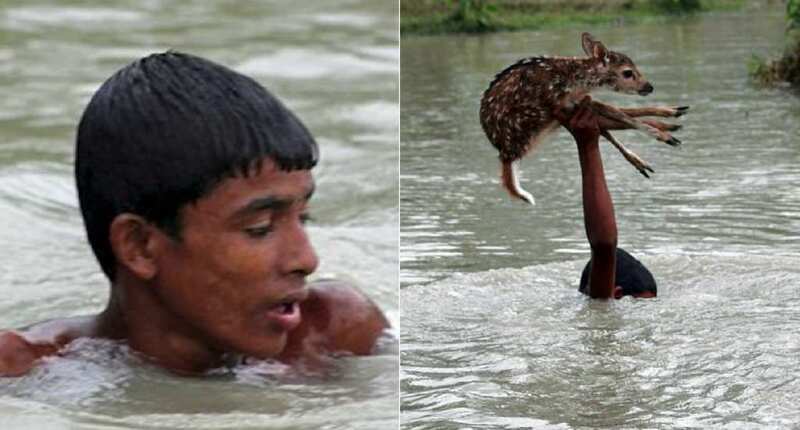 The photo here shows very accurately how much the boy wanted to save this animals life. As you can see, the rapid waters of the river went over the boy’s head a few times. When you consider the fact that the young boy wasn’t that tall, and that he was a young teenager, you’ll realize that this boy’s life may very well have been in danger, as well as the baby deer’s. He was treading water furiously, and trying to get this deer to safety. But if the danger that the boy was in makes you nervous, then we have no doubt that you’re probably in absolute awe to see him in this picture. No joke, this young boy was like a real superhero. 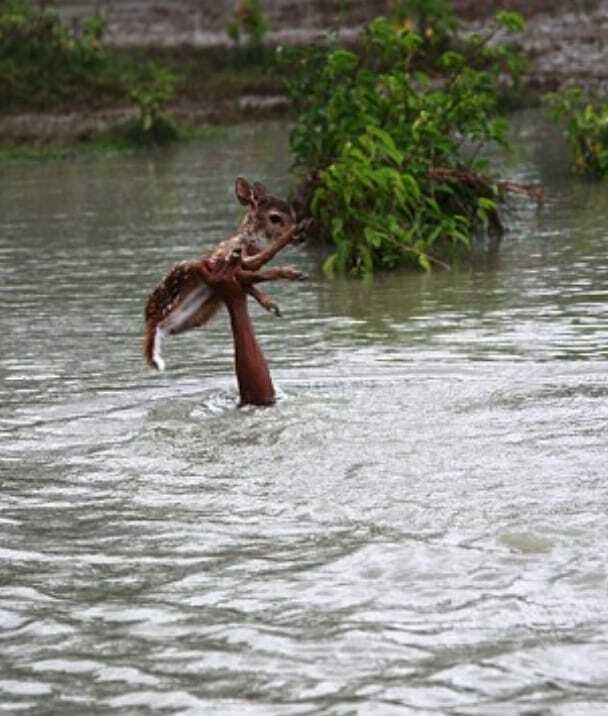 His entire body is completely submerged in the water in this picture, and all you see of him is an outstretched arm, holding up the baby deer to safety. 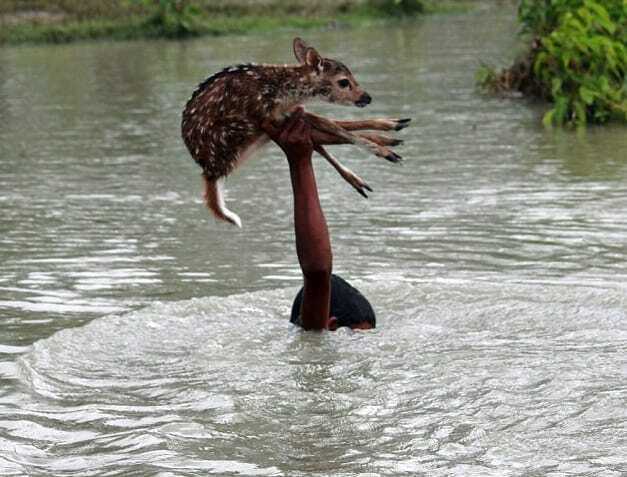 All he cared about was this deer staying alive, and if that meant being underwater for a little while… so be it. Now, the reason that we have such beautiful pictures documenting this whole scene is because of a wildlife photographer named Hasibul Wahab – remember him? He saw the whole thing happen and realized that he was witnessing something legendary. And not only did he take pictures of the whole event, he told the public about it afterward. In fact, it was thanks to him that we even know about it at all. He’s the one that told us all how the story ended. 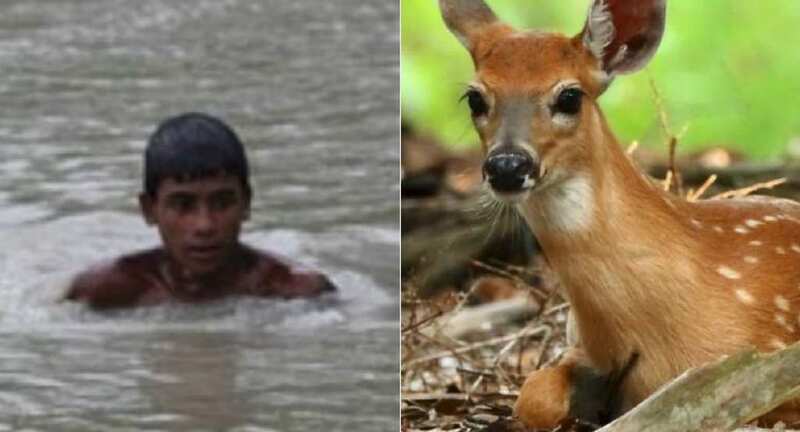 You may or may not have asked yourself the following question: “So let’s get this straight… a young teenager dived in a tumultuous flowing river to save a baby deer, and a photographer just sat there and watched?” Yes, one could certainly perceive it from that point of view. We’ve already acknowledged that the boy himself was in relative danger, and it’s possible that he could’ve used some back up during his efforts – but Wahab wasn’t the only one there. While telling the entire public what had happened, he admitted that he was very “impressed” by the young boy, and he even thought of him to be heroic. That being said, he was also very worried about his safety while the whole thing was happening – and so did his friends. It turns out that Wahab was actually not alone while trekking through the forest, his friends were watching the whole thing unfold as well. And one particular friend was eager to help. After admitting that he and his friends were worried for the boy’s safety as much as they were impressed by him, he said that his friend actually considered saving the boy. “My friend was even ready to jump into the river to save the boy,” said the photographer. It seems that it was unclear to this particular friend how much the boy needed saving. They stood transfixed by the river as Belal, the Bangladeshi teen, treaded water mercilessly and tried to get the deer to shore. The photographer also said that “he was such a brave boy.” He talked about how amazing it was to watch this young kid dive in the river and do everything that needed to be done to make sure the deer stayed alive. 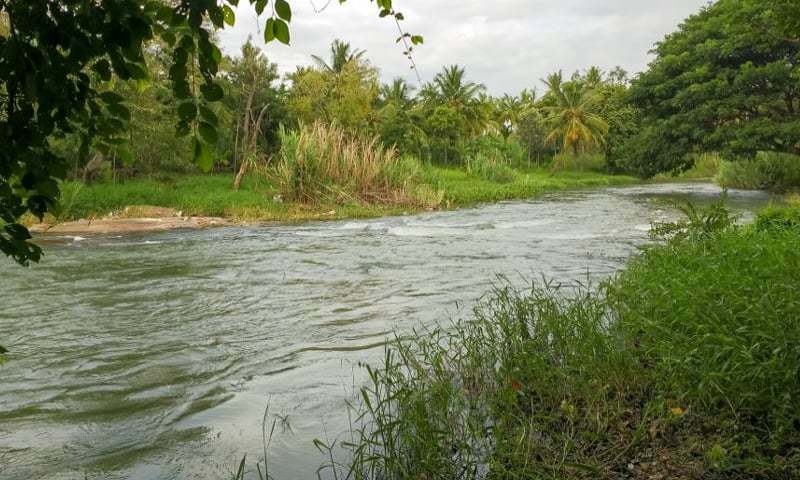 Wahab also said that “the river was so full of water,” and that “it was high tide.” It made them nervous, and for a while, they thought he might drown. But we’re happy to inform you, friends, that the boy survived the endeavor – and here’s how. This story has a gripping start, an heart pounding middle, and a happy ending. 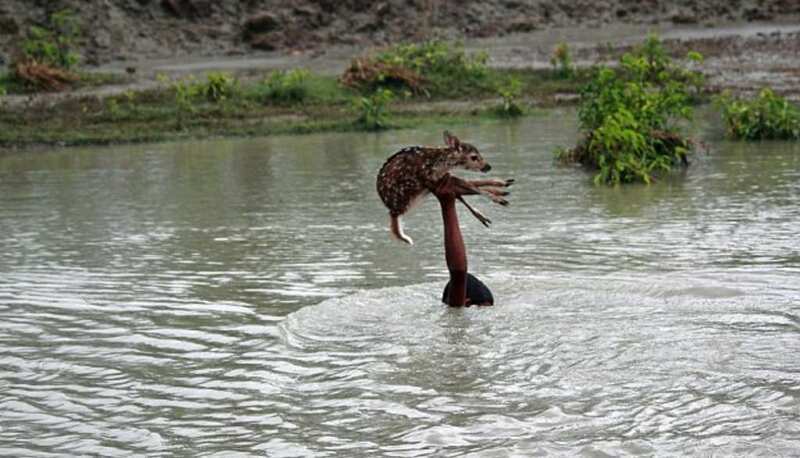 After struggling mightily to keep the baby deer afloat, Belal slowly but surely made his way the shore of the river. And when he did, all of the people in the area cheered. Wahab the photographer said that when he got there, they all praised him. “But he made it, and when he returned, we thanked the boy,” said Wahab. But how many people were there exactly? Like we mentioned earlier, it’s very lucky that this story was witnessed by a number of people, because otherwise this young teen may never have gotten the credit that he so rightfully deserves. There were actually around five to seven people in the vicinity that were able to see these events taking place. But while we’re happy they got inspired, we wonder if they could have done more to help the young boy while he was in the middle of his attempt. Wahab said that for the handful of people that were there to see it, “it was a phenomenal sight.” But while it’s nice that they were all there to appreciate this feat, it also raises a number of questions. We’ve acknowledged that these people thought the boy may have been in danger for a few moments, and we’ve also acknowledged that they thought about jumping in and saving him. Why didn’t they in the end? Luckily the boy survived, but we wonder if he could’ve used some outside help. In life, we are constantly faced with decisions. It’s hard to say what the “right” or “wrong” thing to do is in many scenarios, and it’s important not to judge other people when you haven’t been through their experiences. Sometimes, there is a lot of grey area that exists regarding what is morally correct in a situation, and perhaps this is one of them. What makes Belal’s story actions so inspiring is that we may not have expected it from someone so young. On the flip side, the older individuals that witnessed the boy saving the little deer maybe have been able to learn something from him. We’re not saying they’re wrong for not helping him… we’re just in awe that a young boy like that was able to have such a strong positive influence on not only the older folks around him, but on the precious life of a baby deer that found himself in a very scary situation.